The jet structure on comet Wild 2 is radically different from what orthodox comet models anticipated. Such jets pose no problem for the electrical model. NASA's Stardust spacecraft snapped these photos of Comet Wild 2 on January 2, 2004. 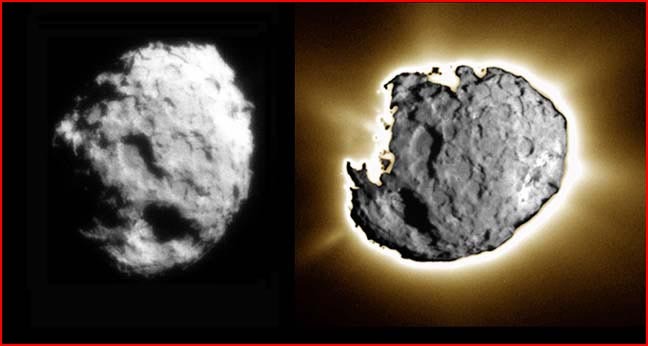 On the left is the comet nucleus and on the right a composite of the nucleus and a longer exposure highlighting the comet's jets. According to a recent press release, project scientists expected "a dirty, black, fluffy snowball" with a couple of jets that would be "dispersed into a halo". Instead they found more than two dozen jets that "remained intact"-they did not disperse in the fashion of a gas in a vacuum. Some of the jets emanated from the dark unheated side of the comet-an anomaly no one had expected. Chunks of the comet, some as big as bullets, blasted the spacecraft as it crossed three jets. Wild 2's surface was covered with "spires, pits and craters" that could only be supported by rock, not by sublimating ice or snow. The discovery was more than surprising, "it was mind-boggling". When a theory's predictions are constantly discredited by new discoveries, it is "falsified". The unexpected blast of particles hitting Stardust is one small ding for the spacecraft's shield, but the Wild 2 anomalies are one giant fender-bender for the dirty snowball theory. For many years now, the theory itself has obstructed the view of evidence, including close-up photographs of comets and asteroids. The NASA press release claims the comet "is unlike any other type of solar system body". Unlike Comet Borrelly, which sported unexpected "mountains, faults and grooves"? Unlike comet Halley, with its hot jets and diverse landscape? Unlike the steep-edged and flat-bottomed craters on asteroids Eros and Mathilda and Ida? Unlike the scarred surface of the Martian moon Phobos, virtually all the Jovian moons (especially the little ones), and now Saturn's little moon Phoebe? Every small solid body we've approached has surprised scientists with such sharply-defined surface relief. The cascade of discovery has not surprised scientists investigating electrified plasma in space. But astronomers and astrophysicists are unaware of this century-old field of study. The structural details of the craters, grooves, cliffs, and other landforms, as well as the collimated jets, match those produced in plasma labs. In the electrical hypothesis, a rock moving rapidly through the electric field of the Sun will develop a plasma sheath that stretches into a coma thousands of kilometers across and a filamentary tail that remains coherent over millions of kilometers. Arcing to the surface will generate high temperatures in small areas. The electrical activity will produce X-rays and ultraviolet light. The predictions of the model are testable, and the implications reach far beyond modern comet theory.